He did it in 2012, 2013, and now, he’s ready to rock 2014. The impressive and talented Comedian; IGOS returns in grand style and continues to uphold its promise to give you the time of your life, with the 3rd edition of the brilliantly successful IGOS Live comedy series. 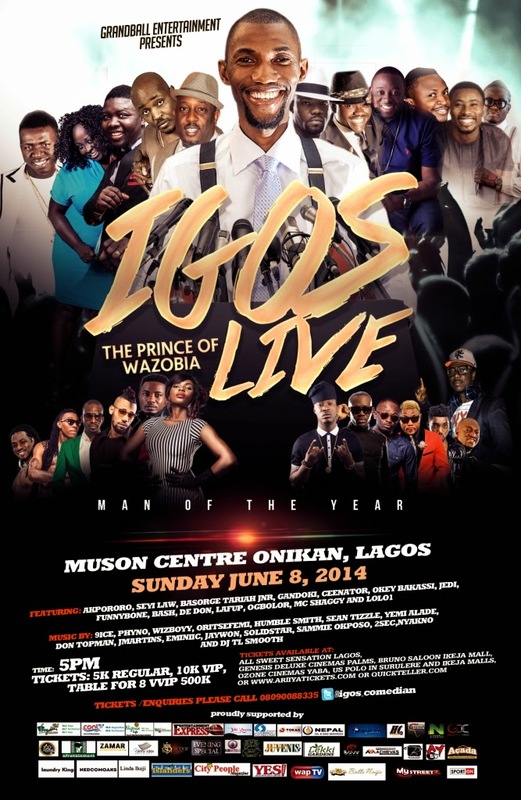 The show, which is themed ‘Man of the Year’, will hold on Sunday 8th of June 2014 at the Muson center, Onikan, Lagos by 5pm. The multiple award-winning Igos is an on-air personality with 95.1 Wazobia FM who has produced concerts such as ‘Igos - D’Prince of Wazobia Live’ and ‘Palava Injection with Igos and Lolo 1’ and has to his credit impressive performances such as Nite of a Thousand Laffs, Alibaba Live, Standup Nigeria, Cool FM Praise Jam, AY Live, Made in Warri, Rhythm Unplugged, as well as Basketmouth’s Lords of the Rib. Produced by Grandball Entertainment, IGOS Live 3 will feature some of the finest names in Nigerian comedy including Akpororo, Seyi Law, Basorge Tariah Jnr., Gandoki, Ceenator, Okey Bakassi, Jedi, Funnybone, Bash De Don, Lafup, Ogbolor, MC Shaggy and Lolo 1. The show also promises some of the most dazzling performances from Nigeria’s biggest musical acts including 9ice, Phyno, Wizboyy, Oritsefemi, Humble Smith, Sean Tizzle, Yemi Alade, Don Topman, Jmartins, Eminiic, Jaywon, Solidstar, Sammie Okposo & DJ TL Smooth and will be hosted by veteran broadcaster, Freeze.